Ver abajo el escrito enviado el 10 de octubre de 2012 al SCENIRH (Scientific Committee on Emerging and Newly Identified Health Risks o Comité Científico sobre Riesgos Sanitarios Emergentes y Recientemente Identificados) y, a continuación, copiamos-pegamos la confirmación de la recepción del escrito, por contener, entendemos, también información de interés. Ver a continuación los archivos (informes médicos, etc.) que le fueron adjuntados al Comité SCENIHR en dicho escrito, de modo que pudieran comprobar que hay afectados por amalgamas dentales con nombres y apellidos, no meras posibilidades de que algo le pueda pasar a alguien algún día. La afectación de la salud por parte, especialmente, del mercurio presente en amalgamas de mercurio, es evitable, pero ha ocurrido, ocurre y seguirá ocurriendo mientras se siga poniendo alegremente mercurio en nuestras bocas (inclusive en las bocas de niños, embarazadas/mujeres en edad fértil, personas con importante afectación renal, etc.). With regard to the evaluation of the safety/non safety of dental (mercury) amalgams, I am attaching a number of files (mainly health reports) that show that it has been officially recognised by the Spain Health Authorities that I have many symptoms and illnesses (some systemic) that derive from a Chronic Mercury Poisoning due to 4 dental amalgam fillings I had between 1988 and 2005. This Hg poisoning was diagnosed in 2005, but the health authorities established that I have had the Hg poisoning since 1998. As you will see in the attached documents, it was established that the Hg vapour of my 4 dental amalgams could come out more easily, or evaporated more easily, mainly due to the fact that the dentist who placed the amalgams did so negligently (what he did changed my bite so there was a progressive erosion of my teeth, including the erosion of the dental amalgams, and tooth wear is one of the main factors which increase the evaporation of dental mercury). This controversy became less acute as the use of mercury in dental amalgam became more common and accepted, though in fact its dangers were always tacitly recognised (see the attached contraindications listed by amalgam manufacturers). In recent years, as the number of cases related to mercury amalgam has grown, the controversy has reignited and dangers recognised long ago are being re-examined. Either the ions (metal salts) work as poisons, which may form from the metal (chemical Influences). Or the potential difference (voltage) effects some sort of functional disturbance in the organism (physical influence)." (Translated from the German by B. Calhoun). The author of the just mentioned web site has the following comments about the subject of differing metals: It is part of the basics of the knowledge of physics that a voltage difference, the so-called "potential difference," exists between two different metals or metal alloys. Now, if these two metals make contact, or if there is a conductor or a conducting medium, then this voltage difference is being evened out by an electrical current. In an oral cavity, which has been treated with differing alloys, appears - explained in this way - the phenomenon of the co-called "mouth battery." In order to get an idea about the "quantities" and "strengths" of this equalization of potential only this needs to be mentioned: In order to effect a stimulus transfer on a healthy neuron, the cells have to produce 95 millivolts (the so-called "action potential"). The measurements between two alloys in the oral cavity amount to up to 300 millivolts. Also, the European Parliament stressed the growing number of people affected by Dental Amalgam Syndrome in its Resolution of the 4th September 2008 on the midterm review of the European Environment and Health Action Plan 2004-2010 (2007/2252(INI) (http://www.europarl.europa.eu/sides/getDoc.do?pubRef=-//EP//TEXT+TA+P6-TA-2008-0410+0+DOC+XML+V0//EN -- read letter J., which says: “J. whereas these problematic developments in environmental health have been accompanied in recent years by the emergence of new diseases or syndromes, such as multiple chemical hypersensibility, dental-amalgam syndrome, hypersensitivity to electromagnetic radiation, sick-building syndrome and attention-deficit and hyperactivity syndrome in children”. • Psychological and behavioural problems (mainly depression, anxiety and sleeping problems). In the early ‘90s he presented at the Court of Frankfurt a claim against the German producer of amalgam fillings, Degussa. 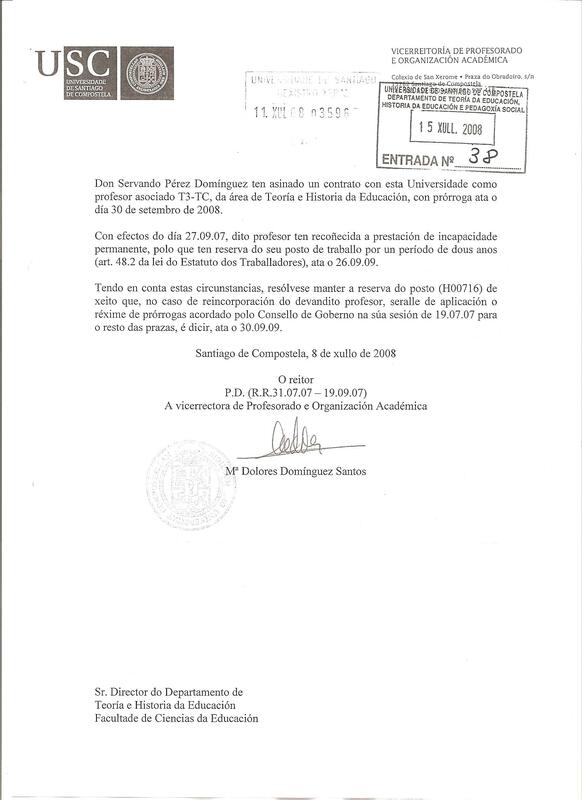 The controversy was settled with an agreement in 1997 and Degussa had to pay 1.200.000 marks (about 600.000 euro) for the research about safer alternative for dental fillings. It is important to point out that during the process Prof. Otto Wasserman and colleagues of the University of Kiel produced, on request of the prosecutor of the Frankfurt, a report claiming that amalgam can have highly toxic effects on the long term (3). Without the proper diagnostic tests and clinical experience it is very difficult to recognize the adverse health-effects of amalgam. The allergy to the metals of amalgam, for example, is very undervalued issue because the lymphocytes transformation test (LTT-MELISA) is not available in all the EU countries. This is the specific test for the diagnosis of allergy of type IV that is the most common type of allergy to metals, while skin provocation tests (such as patch test) can prove mainly the allergy of type I (“immediate allergy” or “contact allergy”), that is very rare in the case of metals. The same problem occurs with other important diagnostic test for amalgam poisoning which are very difficult to find in many EU countries: 1) post stimulation multi-element analysis of metals in saliva (also known as “chewing-gum test” (4-7) and 2) DMSA/DMPS challenge test that measures the levels of toxic overload (8-12). Consequently, there are people with systemic reactions to the metals of amalgam who can not have an appropriate diagnosis and treatment. Moreover, even when the allergic response to amalgam is certified, the medical treatment is quite uncertain. When dental amalgams were introduced widely in dentistry (around the 1930’s) concerns about the safety of this dental material (50% of elemental Hg) arose. In fact, as early as 1833, some dental surgeons voiced their concern about dental amalgam’s effectiveness as a material; others were worried about mercury poisoning, as it was already widely known that exposure to this metal causes observable side effects (such as dementia and loss of motor coordination). Deeply concerned by this matter, Dr. C.A Harris founded in 1840 the American Society of Dental Surgeons (ASDS), which being aware of the evidence of the side effects of amalgam, in 1845 forbade its use by all members. During the following decade, several members of the ASDS used amalgam dental fillings and were expelled for malpractice. We should bear in mind that in the first third of the 19th century, dentistry was in turmoil. No legal standards or requirements as to the type of training necessary for practitioners existed to protect patients. Even if one had no formal training, let alone any schooling, individuals could treat patients who had dental and oral diseases. Moreover, before 1840 there wasn’t a single school of dentistry anywhere in the world and teaching to practitioners of the trade was based on the preceptoral —or apprenticeship— method. There was no standardized curriculum and what was taught was left to the discretion of the preceptor. In this context, dental (mercury) amalgams where introduced into dentistry and placed in people’s mouths. Therefore, me, representing MERCURIADOS NGO, plus other people representing other NGO’s/Organizations in a meeting on 20th January 2009 regarding provisional conclusions of SCHER and SCENIHR expert committees regarding dental amalgams and alternative dental materials, expressed our concern on various things, also about the fact that the right of information (one fundamental right included in the Universal Declaration of Human Rights) was not taken into consideration. We argued this because public health authorities (at national and international level) did not, and still do not, inform the general population (specifically dental patients, who are potentially entire populations) that: (1) dental (‘silver’) amalgam contain Hg (50% Hg); (2) that Hg is one of the most damaging substance on earth to health and the environment; and (3) that there is no ‘safe’ level of Hg (particularly in combination with other toxic substances). However, in the final conclusions of SCHER and SCENIHR in 2008 this fundamental right was not acknowledged either. The dental amalgam controversy refers to the conflicting views over the use of amalgam as a filling material mainly because it contains the element mercury. Scientists agree that dental amalgam fillings leach mercury into the mouth, but studies vary widely in the amount and whether such amount presents significant health risks. Estimations run from 1-3 micrograms (µg) per day (FDA) up to 27 µg/day (Patterson). The effects of that amount of exposure is also disputed,. The use of mercury in dental fillings is approved in most countries. Canada, Norway, Denmark, and Sweden have banned the use of mercury in dental amalgams over health concerns. Dentists who advocate the use of amalgam point out that it is durable, relatively inexpensive, and easy to use. On average, resin composites last only half as long as dental amalgam (although more recent studies find them comparable to amalgam in durability),  and dental porcelain is much more expensive. However, the gap between amalgam and composites may be closing. Further, concerns have been raised about the endocrine disrupting (in particular, estrogen-mimicking) effects of plastic chemicals such as Bisphenol A used in composite resins. In addition to health and ethics issues, opponents to dental amalgam fillings point to the negative externalities of water contamination and environmental damage of mercury. This concern is especially worrisome since its use and disposal by dentists goes largely unregulated in many places, including the United States. The WHO reports that mercury from amalgam and laboratory devices accounts for 53% of total mercury emissions. Separators may dramatically decrease the release of mercury into the public sewer system, where dental amalgams contribute one-third of the mercury waste, but they are not required by some states in the United States. The broad lack of knowledge that existed among the public was displayed when a December 1990 episode of the CBS news program "60 Minutes" covered mercury in amalgam. This resulted in a nationwide amalgam scare and additional research into mercury release from amalgam. The following month Consumer Reports published an article criticizing the content of the broadcast, stating that it contained a great deal of false information and that the ADA spokesperson on the program was ill prepared to defend the claims. The amount of mercury patients are subjected to is itself controversial. Many studies have been conducted and findings have varied substantially. Depending on the study, average systemic uptake levels have been estimated to range between 1.7 µg/day and 17 µg/day. As a (straight) comparison, these daily absorption levels comprise between 3.4% and 68% of workplace air quality safety standards (which range from 25 to 50 micrograms per cubic meter of air). Critics point out that: (1) the workplace safety standards are based on allowable maximums in the workplace, not mercury body burden; (2) the workplace safety numbers are not applicable to continuous 24hr exposure, they're limited to a normal work day and 40 hr work-week; and (3) the uptake/absorption numbers are averages and not worst case patients (those most at risk). A study conducted by measuring the intraoral vapor levels over a 24-hour period in patients with at least nine amalgam restorations showed the average daily dose of inhaled mercury vapor was 1.7 µg (range from 0.4 to 4.4 µg), which is approximately only 3.4% of the threshold limit value of the OSHA maximum allowable environmental level of 50 µg/day in the workplace. The World Health Organization (WHO) notes that exposure can be greatly increased by personal habits such as bruxism and gum-chewing and cites a report which found a 5.3 fold increase in mercury levels after chewing, eating, or toothbrushing. They report that amalgam is estimated to contribute 50% of mercury exposure in adults. In the studies the WHO reviews, daily mercury exposure estimates range from 3 μg/day to 9 μg/day. A Swedish study of autopsies examined the mercury levels in brains and kidneys and found a strong correlation with the number of amalgam fillings. A German study found that mercury urinary excretion was significantly higher in those with dental amalgam fillings. Research on monkeys has shown that mercury released from dental amalgam restorations is absorbed and accumulates in various organs such as the kidney, brain, lung, liver, gastro-intestinal tract, the exocrine glands. It was also found to have crossed the placental barrier in pregnant rats and shown to cross the gastrointestinal mucosa when amalgam particles are swallowed after amalgam insertion or after removal of old amalgam fillings. Peer-reviewed scientific studies have come to opposite conclusions on whether the mercury exposure from amalgam fillings causes health problems. A 2004 systematic review conducted by the Life Sciences Research Office, whose clients include the FDA and NIH, concluded that "the current data are insufficient to support an association between mercury release from dental amalgam and the various complaints that have been attributed to this restoration material". A peer-reviewed Journal of the Canadian Dental Association article holds that "it seems likely that humans may have evolved with a threshold level for mercury below which there is no response or observable adverse health effects". Another review published in 2005 by the Freiburg University Institute for Environmental Medicine found that "mercury from dental amalgam may lead to nephrotoxicity, neurobehavioural changes, autoimmunity, oxidative stress, autism, skin and mucosa alterations or non-specific symptoms and complaints", that "Alzheimer's disease or multiple sclerosis has also been linked to low-dose mercury exposure", and that "removal of dental amalgam leads to permanent improvement of various chronic complaints in a relevant number of patients in various trials." Potential amalgam-induced health risks which have been studied by researchers include those related to allergy as well as toxicity. In 2002, the Food and Drug Administration issued a statement on dental amalgam which asserted that "no valid scientific evidence has shown that amalgams cause harm to patients with dental restorations, except in the rare case of allergy". A 1991-1997 study of 3162 patients in Sweden and Germany found that 719 of those with mercury fillings, or 23 percent, tested positive for systemic allergic sensitivity to inorganic mercury on the MELISA lymphocyte proliferation test. In a smaller group of 85 patients who suffered from symptoms resembling Chronic Fatigue Syndrome and had their amalgams replaced with composites and metal-free ceramics, "over 78 percent reported improvement in health status as compared to the period prior to metal removal." A paper published as part of a 1991 National Institutes of Health conference on side-effects of dental restorative materials reported a 22.53% incidence of allergy in subjects who had amalgam fillings for more than five years. Despite these findings, the ADA claimed as recently as 2004 that there had been less than 100 reported cases of allergic reactions to amalgam fillings. In 2001, the United States National Health and Nutrition Examination Survey of 31,000 adult Americans, NHANES III, covering 1988-94, was published by the National Center for Health Statistics (NCHS). It is statistically valid for all 180,000,000 adult Americans. The survey found that the number of dental fillings was significantly correlated to incidence of cancer, thyroid conditions, mental conditions, diseases of the nervous system including MS, diseases of the respiratory and genito-urinary systems, and disorders of the eye, circulatory and respiratory systems. At the time of the survey (1988–94), the vast majority of dental fillings placed were silver amalgam. However, the United States FDA, various supreme court judges and others have determined that correlation does not sufficiently demonstrate causation. Ten years earlier, unrelated to NHANES III and before the NHANES/Dental Filling correlations, in 1991 the United States Food and Drug Administration concluded that "none of the data presented show a direct hazard to humans from dental amalgams." The Food and Drug Administration in 2008 subsequently issued an advisory warning pregnant women and children about dental amalgam containing mercury, and posted this warning on their website. Again unrelated to NHANES III, on February 18, 2003, the New York Supreme Court dismissed two amalgam-related lawsuits against organized dentistry, stating the plaintiffs had "failed to show a 'cognizable cause of action'." The plaintiffs blamed the ADA, the New York Dental Association and the Fifth District Dental Society for deceiving the "public about health risks allegedly associated with dental amalgam." Dental amalgam is the most common form of exposure to elemental mercury in the general population, constituting a potentially significant source of exposure to elemental mercury, with estimates of daily intake from amalgam restorations ranging from 1 to 12.5 μg/day, the majority of dental amalgam holders being exposed to less than 5 μg mercury/day. The report also notes that regarding elemental mercury exposure, the main form of exposure from dental amalgam," most studies rely on assessment of exposure at the time of study, which may not be fully informative, as mercury has a long half-life in the body and thus accumulates in continuous exposure ", making the evaluation of effects on health uncertain. Other lesser findings were reported, including a cross-sectional study in which cognitive function was not related to the number or surface area of occlusal dental amalgams, a case-control study in which patients with numerous amalgam fillings exhibited higher levels of neurological symptoms than the controls, and a study of self-referred patients who believed they were suffering ill-effects from dental amalgams which found no correlation between number of dental fillings and symptomatology, but higher mean neuroticism than two comparison groups (the authors concluded that self-referred patients with health complaints attributed to dental amalgam are a heterogeneous group of patients who suffer multiple symptoms and frequently have mental disorders). In 2002, Maths Berlin, Professor Emeritus of Environmental Medicine and Chair of the 1991 World Health Organization Task Group on Environmental Health Criteria for Inorganic Mercury published an overview and assessment of the scientific literature published between November 1997-2002 as part of a special investigation for the Swedish Government on amalgam related health issues. The 2002 report was a follow-up to a similar review of the literature published between 1993 and November 1997. The 2002 review assessed over 700 references. A final report was submitted to the Swedish Government on 3 June 2003 and included Berlin's report as an annex to the full report. Berlin's annex was translated into English and is currently available from the Government Offices of Sweden along with an introduction and summary of the full report. Berlin's 2002 review includes a summary of the 1997 analysis. • The WHO estimate of amalgam bearers' daily mercury uptake was 3-7 µg, which was the best estimate available at the time. This uptake gives rise to urinary mercury secretion of around 5 µg/g creatinine. However, WHO found wide variation between individuals. • In subsequent studies of amalgam bearers, uptake of up to 100 µg daily has been observed in extreme cases. The individuals concerned had urinary secretion of around 50 µg/g creatinine. This secretion rate is as high as, or higher than, the lowest exposure shown to provoke clinically demonstrable symptoms in mercury-exposed workers. • There are no scientific grounds for assuming that the prevalence of clinically demonstrable effects of mercury exposure from dental amalgam exceeds 10 per cent. • No known epidemiological population study has demonstrated any adverse health effects in amalgam bearers. • Mercury is a potent toxin that affects the basic functions of the cell by bonding strongly with sulfhydryl and selenohydryl groups on albumen molecules in cell membranes, receptors and intracellular signal links, and by modifying the tertiary structure. • The structure of albumen molecules is genetically determined, and this leaves ample scope for genetic polymorphism to manifest itself in varying sensitivity and types of reaction to mercury exposure. • It is probable that, besides local hypersensitivity reactions, mercury in amalgam fillings exerts side-effects just like most potent pharmaceuticals. Some support for this conclusion is to be found in clinical observations reported to date. At a rate that is probably below 10 per cent, however these side-effects cannot be demonstrated by means of population-based epidemiological studies. • Risk of impairment in the functions of the central nervous system. • Risk of impairment in kidney function. • Risk of impairment in the immune system. • Risk of impairment in fetal development, especially development of the nervous system." • Research in molecular biology has elucidated mechanisms that may underlie the toxic effects of mercury. • Studies of the effects of mercury on the immune system in rodents have enhanced knowledge of the mechanisms whereby mercury affects the immune system. Clinical studies of occupationally exposed employees have objectively confirmed subclinical influence of mercury on the immune system at low levels of mercury exposure. • The thyroid has been identified as the target organ for the toxic effect of mercury in occupational exposure to mercury vapour in low doses. • Experimental studies of primates and rodents have revealed that mercury is accumulated and persists for years in the retina as a result of exposure to mercury vapour. The consequences of this accumulation are, however, unclear. • Clinical studies of the effects of mercury on occupationally exposed workers, using modern diagnostic methods, have elucidated the connection between dose and effect. They have also identified and quantified neuropsychological symptoms at low exposure levels. • The lowest exposure, in terms of urinary mercury secretion, that has been found to give rise to a demonstrable toxic effect has fallen from 30-50 μg/l to 10-25 μg/l. Accordingly, the safety margin that it was thought existed with respect to mercury exposure from amalgam has been erased. • Studies of workers previously exposed to mercury have shown that prolonged exposure to mercury vapour, with mercury concentrations in urine of some 100 μg/l, may result in symptoms emanating from the nervous system that persist decades after exposure has ceased. This suggests that exposure causes lasting damage to the central nervous system, which complicates the interpretation of results of low-dose studies of occupationally exposed populations. • Clinical reports of acute or subacute cases of mercury intoxication where modern diagnostic methods have been applied have revealed a remarkably high degree of polymorphism in human reactions to toxic mercury exposure. • Both animal experiments and clinical observations have demonstrated gender differences in the toxicokinetics of mercury. • Additional facts have come to light that may indicate that mercury vapour can affect human foetal development. • Clinical provocation studies, with exposure to small quantities of mercury through skin exposure or inhalation, have confirmed that individuals with deviant high sensitivity exist." "With reference to the fact that mercury is a multipotent toxin with effects on several levels of the biochemical dynamics of the cell, amalgam must be considered to be an unsuitable material for dental restoration. This is especially true since fully adequate and less toxic alternatives are available. With reference to the risk of inhibiting influence on the growing brain, it is not compatible with science and well-tried experience to use amalgam fillings in children and fertile women. Every doctor and dentist should, where patients are suffering from unclear pathological states and autoimmune diseases, consider whether side-effects from mercury released from amalgam may be one contributory cause of the symptoms. For medical reasons, amalgam should be eliminated in dental care as soon as possible. This will confer gains in three respects: The prevalence of side-effects from patients’ mercury exposure will decline; occupational exposure to mercury can cease in dental care; and one of our largest sources of mercury in the environment can be eliminated." The proper interpretation of the data on hand is, to date, controversial. The vast majority of past studies have concluded, not without controversy, that amalgams are safe. However, although the vast majority of patients with amalgam fillings are exposed to levels too low to pose a risk to health, many patients (i.e. those in the upper 99.9 percentile) exhibit urine test results which are comparable to the maximum allowable legal limits for long-term work place (occupational) safety. Two recent randomized clinical trials in children  discovered no statistically significant differences in adverse neuropsychological or renal effects observed over the five-year period in children whose caries were restored using dental amalgam or composite materials. In contrast, one study showed a trend of higher dental treatment need later in children with composite dental fillings, and thus, claimed that amalgam fillings are more durable. However, the other study (published in JAMA) cites increased mercury blood levels in children with amalgam fillings. The study states, "during follow-up [blood mercury levels were] 1.0 to 1.5 μg higher in the amalgam group than in the composite group." EPA considers high blood mercury levels to be harmful to the fetus, and also states that "exposure at high levels can harm the brain, heart, kidneys, lungs, and immune system of people of all ages." Currently, EPA has set the "safe" mercury exposure level to be at 5.8 μg of mercury per one liter of blood. While mercury fillings themselves do not increase mercury levels above "safe" levels, they have been shown to contribute to such increase. However, such studies were unable to find any negative neurobehavioral effects. During the FDA's December 13–14, 2010 CDHR panel review of the International Academy of Oral Medicine and Toxicology's request for reconsideration to the classification of amalgam, neurologists questioned the type of neurobehavorial tests and the unethical nature of a prospective trial looking for brain damage in children. Furthermore, evidence was presented by the Geier's that further analysis of the data found that an unusual porphyrin called Coproporphyrinogen indicative of pathophysiology (harm) was found in a dose response relationship to the number and size of amalgams placed, thus calling into question the claim that no injury had occurred. As a result of a lawsuit, a fund was developed to research amalgam-related illness, and a clinical trial evaluating the effect of removing amalgam was published in 2008. The trial found that all groups had improved symptoms, including a group where the participants were treated with a "biological detoxification" therapy and dental amalgam was not removed. Follow-up of a clinical trial was published in 2010. The American Dental Association (ADA) has asserted that dental amalgam is safe since its foundation in 1859. In its advisory opinion to Rule 5.A. of the ADA Code of Ethics, it has also held that, "the removal of amalgam restorations from the non-allergic patient for the alleged purpose of removing toxic substances from the body, when such treatment is performed solely at the recommendation or suggestion of the dentist, is improper and unethical". According to the Boston College Law School study, "A dentist who is found guilty of violating the ADA Code of Ethics can be sentenced, censured, suspended, or expelled from the ADA" and the "ADA forbids its dentists from suggesting mercury removal under threat of license suspension". The same study pointed out that state dental associations and disciplinary boards have "not only adopted the ADA's position as a matter of routine" in proceedings which have sanctioned anti-amalgam dentists or stripped them of their licenses in California, Maryland, Arizona, Colorado, and Minnesota, but in many cases "the board members themselves often belonged to the ADA as well". A 2002 article in the Atlanta Journal and Constitution reported allegations by anti-amalgamists that the ADA had effectively imposed gag rules which forbade them from discussing their positions with patients. The Boston College Law School study also cites proceedings in which an Arizona dentist, "is facing sanctions for advocating alternative materials", a California dentist lost his license, "for running an advertisement entitled: "Mercury Emission from Silver Filings Unsafe by Government Standards", and a Maryland dentist, "was sanctioned for writing an article on dental amalgam removal". More recently, the ADA has entered into litigation "aimed at defending its reputation and discouraging further lawsuits by patient-plaintiffs against dental amalgam". Some practitioners may also recommend that patients with amalgam fillings have them removed and replaced, particularly if the patient is experiencing the symptoms that they attribute to the use of amalgam. These professionals recommend that unprotected amalgam removal should be avoided even in routine dental procedures to avoid exposure to mercury vapor and amalgam particulate matter. Consumer Reports magazine, claims that the connection between many of these diseases and amalgam fillings is solely revenue generating propaganda. Consumer Reports told its readers on several occasions that "if a dentist wants to remove your fillings because they contain mercury, watch your wallet." Better dental health overall coupled with increased demand for more modern alternatives such as resin composite fillings (which match the tooth color), as well as public concern about the mercury content of dental amalgam, have resulted in a steady decline in dental amalgam in developed countries, though overall amalgam use continues to rise worldwide. Given its superior strength, durability and long life relative to the more expensive composite fillings, it will likely be around for many more years to come. Dental amalgam has been found to be a frequent contributor to oral lichenoid lesions and is possibly a variable associated with an increased risk of other autoimmune conditions such as multiple sclerosis, lupus, thyroiditis and eczema. In 1994 Rowland found a 40% decline in fecundability in a case controlled study of female dental assistants exposed to mercury in dental offices. There has been no evidence that dentists who are exposed to dental amalgam and vapor on a daily basis get mercury poisoning however individual dentists and staff members have become mercury poisoned and studies of the dental profession has documented a decline in cognitive abilities greater than the non-mercury exposed individuals. Some studies have indicated that mercury from dental amalgam has mild effects on some dentists. Dentists in several large-scale studies performed multiple cognitive tests and, compared to a normal population, lagged behind in many areas. A small-scale study based in Singapore found the "exposed-dentist" group had 14% worse scores in memory, co-ordination, motor speed and concentration compared to the control group. The study did not demonstrate any link between mercury exposure and these lagging scores, however. A newer study also found a link between cognitive impairment (including mood) and dental work, even though "exposure among these dental personnel is not much greater than exposures to the general population through the dental amalgam in their fillings" as shown by urinary studies. Twelve of 13 symptoms were correlated with greater mercury exposure. A study examining the health effects of mercury on dentists in the UK published in the Occupational and Environmental Medicine Journal concluded that 180 dentists had on average 4 times the urinary mercury excretion levels of 180 people in a control group. Dentists were significantly more likely than control subjects to have had disorders of the kidney or memory disturbance. No direct correlation between urinary mercury levels and the disability, however, was found. Urine testing is unreliable for showing lifetime mercury accumulation rather than recent exposure. The WHO reports that mercury from amalgam and laboratory devices accounts for 53% of total mercury emissions, and that one-third of the mercury in the sewage system comes from dental amalgam flushed down the drain. Mercury is an environmental toxin and the World Health Organization, OSHA, and NIOSH have established specific occupational exposure limits. Amalgam removed from teeth is classified as toxic waste in various countries, but in many countries it is not regulated, including the United States. The environmental pollution of mercury imposes health risks upon the surrounding population; in economics this pollution is considered an external cost not factored into the private costs of using dental amalgam. Separators may dramatically decrease the release of mercury into the public sewer system, but they are not required in the United States. Environmental risks are mitigated provided that amalgams are disposed of properly. ISO has issued standards regarding the proper handling and disposal of amalgam waste, and legislation to enforce these standards is being adopted in some US states. The Association of Metropolitan Sewerage Agencies (AMSA) studied seven major waste-water treatment plants and found that dental uses were "by far" the greatest contributors of mercury load, on average contributing 40%, over 3 times the next greatest contributor. The EPA recognizes dental amalgam as a major source of the mercury in the water. The Western Lake Superior Sanitary District that dentists emit .1 grams of mercury per day per dentist. Based on this, dental amalgam contributes 14% of the mercury in Seattle and 12% of the mercury in San Francisco. 4% of the mercury in Lake Superior is believed to originate from amalgam. The National Association of Clean Water Agencies noted in a report that purification of mercury from waste water will impose a significant financial burden upon municipal treatment plants. Several other groups have analyzed mercury in waste water and concluded that it is a serious problem. Other studies have shown this to be a gross exaggeration. With respect to pollution in the United States, a study done in 1992 showed that batteries "accounted for 86 percent of discarded mercury and dental amalgam a mere 0.56 percent." Cremation of bodies containing amalgam restorations results in near-complete emission of the mercury to the atmosphere, as the temperature in cremation is far greater than the boiling point of mercury. In countries with high cremation rates (such as the United Kingdom), mercury has become a great concern. Proposals to remedy the situation have ranged from removing amalgam-containing teeth prior to cremation to installing activated carbon adsorption or other post-combustion mercury capture technology in the flue gas stream. These proposals range from unpopular to expensive. Studies have shown the amount of mercury to be released per body cremated to range from 0.25 grams to slightly over 1.00 grams. The number of amalgam fillings and their size determines the volume of mercury released, as well as any deposition which may occur in the backend of the cremation equipment, either incidental or intentional (e.g. if a baghouse or other filtration system is employed). As a comparison, a mercury thermometer contains 0.50 grams of mercury, and an average compact fluorescent lamp contains 0.004 grams of mercury. Such numbers indicate that the average cremation of a body with amalgam emits as much mercury as is contained in 156 compact fluorescent lamps. Most of these materials, with the notable exception of gold, have not been used as long as amalgam and some are known to contain other potentially hazardous compounds. This is why biocompatibility testing is recommended for all dental materials as per ADA/ANSA or ISO standards, and can be performed by specialized laboratories. Some experts also caution against a too-sudden shift towards composite resin to allow time for dentists to acquire the skills needed to properly place resin fillings since "clinical studies on the longevity of amalgam and resin composite restorations placed by dental students and dentists who are experienced in both composite resin and amalgam placement show a comparable and acceptable annual failure rate for those restorations". Teaching of amalgam techniques to dental students is declining in some schools in favor of composite resin, and at least one school, University of Nijmegen in the Netherlands, had eliminated dental amalgam from the curriculum entirely in 2001. Alfred Stock, a noted chemist, reported becoming very ill, and eventually tracing his illness to his amalgam fillings and the resulting mercury intoxication. He described his recovery after the fillings were removed and believed that amalgam fillings would come to be seen as a "sin against humanity." Hal Huggins, a Colorado dentist, is a notable critic of dental amalgams and other dental therapies he believes to be harmful; his views on amalgam toxicity were featured on 60 Minutes. In 1840, the American Society of Dental Surgeons was founded by a group of dentists who met in New York city. It was the only national organization of dentists in existence at the time. Chapin A. Harris, the co-founder of the ASDS and the first dental school in the US, the Baltimore College of Dental Surgery, spoke of dental amalgam in his opening address: "It is one of the most objectionable articles for filling teeth that can be employed, and yet from the wonderful virtues ascribed to this pernicious compound by those who used it, thousands were induced to try its efficacy". In 1845, the ASDS had members sign a mandatory pledge promising not to use mercury fillings because of fear of mercury poisoning in patients and dentists (at the time, dentists made amalgam by mixing liquid mercury and the other components of amalgam themselves in their office, a practice which continued until pre-filled amalgam capsules became generally available in the 1960s). During the next decade some members of the society were suspended for the use of amalgam. Because of its stance against dental amalgam, membership in the American Society of Dental Surgeons declined, and due to the loss of members, the organization disbanded in 1856. In 1859, the American Dental Association (ADA) was founded by twenty-six delegates representing various dental societies in the United States at a meeting in Niagara Falls, New York. The ADA did not forbid use of amalgams. The ADA position on the safety of amalgam has remained consistent since its foundation. As of 2006, the ADA has over 152,000 members and is the largest and longest-standing professional association of dentists in the world. In most European countries (for example, the United Kingdom, France, and Italy), amalgam use is unrestricted [actually, in Italy there are restrictions for pregnant women, children and people with important kidney problems; in Spain, concretely in Catalonia, it is recommended not to place dental amalgams in pregnant women and children under 14 years old]. Some other countries, such as Sweden and Denmark, have banned the use of mercury in dental amalgams, citing health or environmental concerns. The Swedish Chemicals Inspectorate (KemI) maintains a web site containing a report on the investigation for a general ban on mercury on which it states, "KemI judges that there are strong grounds for banning amalgam for environmental reasons. From a health point of view there is every reason to apply a precautionary approach." Some countries, notably Austria and Germany, have some restrictions on dental amalgam, such as permitting its use for the general population, but not for children, pregnant women, people with kidney problems, when in contact with other metals, such as braces, and in people with mercury sensitivity. Amalgam use is illegal in Norway as of 1 January 2008. Sewers from Norwegian dental clinics older than 1994 (or if there is other reason to believe amalgam have ended up in the sewers instead of the patients mouth) shall be cleaned by experienced personnel to properly remove any residual mercury. The detailed procedure to do so is available from Norwegian Pollution Control Authority free of charge. Amalgam use is illegal in Sweden as of 1 April 2008 [actually since 1 June 2009]. The Swedish amalgam ban is for both environmental and health issues, according to the Swedish authorities. In the US, many states are undertaking both regulatory and non-regulatory activities to ensure proper management of mercury-containing dental amalgam. Following the meeting of the joint committees on 6–7 September 2006, when the panel of outside advisers that the FDA had asked to assess the conclusions of its report on amalgam safety rejected the FDA report in a 13-7 vote, they stated the report's conclusions were "unreasonable", given the quantity and quality of information currently available. Panelists said remaining uncertainties about the risk of so-called silver fillings demanded further research, in particular, on the effects of mercury-laden fillings on children and the fetuses of pregnant women with fillings and the release of mercury vapor on insertion and removal of mercury fillings. Michael Aschner, a professor of pediatrics and pharmacology at Vanderbilt University and a panel consultant said "There are too many things we don't know, too many things that were excluded." Shortly after the decision of the joint advisory panel, the president of the International Academy of Oral Medicine and Toxicology (IAOMT) wrote to the FDA to ask for an expanded review of current science on dental amalgams, a definitive date for such a hearing, and a format that will assure that the full breadth of health effects is assessed. In a press release the ADA wrote that it " welcomes the call by a U.S. Food and Drug Administration (FDA) panel for additional review of scientific studies on the safety of dental amalgam fillings." and reiterated that "the overwhelming weight of scientific evidence supports the safety and efficacy of dental amalgam, and it should continue to be made available to dentists and their patients " and " dental amalgam contains elemental mercury combined with other metals such as silver, copper, tin and zinc to form a safe, stable alloy." 1. ^ "Dental Amalgam: Myths vs. Facts" (Press release). American Dental Association. July 2002. http://www.ada.org/public/media/releases/0207_release01.asp. Retrieved 29 July 2009. 2. ^ Koral, Stephen M. (2005). "The Scientific Case Against Amalgam". International Academy of Oral Medicine and Toxicology. http://www.iaomt.org/articles/files/files193/The%20Case%20Against%20Amalgam.pdf. Retrieved 29 July 2009. 3. ^ a b "Review and Analysis of the Literature on the Health Effects of Dental Amalgams". Life Sciences Research Office. http://www.lsro.org/presentation_files/amalgam/amalgam_execsum.pdf. Retrieved 29 July 2009. 4. ^ a b Mutter, J; Naumann, J; Walach, H; Daschner, F (2005). "Amalgam: Eine Risikobewertung unter Berücksichtigung der neuen Literatur bis 2005 [Amalgam risk assessment with coverage of references up to 2005]" (in German). Gesundheitswesen (Bundesverband der Arzte des Offentlichen Gesundheitsdienstes (Germany)) 67 (3): 204–16. doi:10.1055/s-2005-857962. PMID 15789284. 5. ^ a b "Dental Mercury Use Banned in Norway, Sweden and Denmark Because Composites Are Adequate Replacements" (Press release). Mercury Policy Project. 3 January 2008. http://www.reuters.com/article/pressRelease/idUS108558+03-Jan-2008+PRN20080103. Retrieved 29 July 2009. 6. ^ Allan, DN (1977). "A longitudinal study of dental restorations.". British dental journal 143 (3): 87–9. doi:10.1038/sj.bdj.4803949. PMID 268962. 7. ^ Moffa JP (1989). "Comparative performance of amalgam and composite resin restorations and criteria for their use". In Kenneth J. Anusavice. Quality evaluation of dental restorations: criteria for placement and replacement: proceedings of the International Symposium on Criteria for Placement and Replacement of Dental Restorations, Lake Buena Vista, Florida, October 19–21, 1987. Carol Stream, Illinois: Quintessence Publishing. pp. 125–38. ISBN 978-0-86715-202-9. 8. ^ Chadwick, BL; Evans, DJ (2007). "Restoration of class II cavities in primary molar teeth with conventional and resin modified glass ionomer cements: a systematic review of the literature.". European archives of paediatric dentistry: official journal of the European Academy of Paediatric Dentistry 8 (1): 14–21. PMID 17394886. 9. ^ Leinfelder, Karl F. (2000). "DO RESTORATIONS MADE OF AMALGAM OUTLAST THOSE MADE OF RESIN-BASED COMPOSITE?". The Journal of the American Dental Association 131 (8): 1186–7. PMID 10953536. http://jada.ada.org/cgi/pmidlookup?view=long&pmid=10953536. 10. ^ Sasaki, N; Okuda, K; Kato, T; Kakishima, H; Okuma, H; Abe, K; Tachino, H; Tuchida, K et al. (2005). "Salivary bisphenol-A levels detected by ELISA after restoration with composite resin". Journal of materials science. Materials in medicine 16 (4): 297–300. doi:10.1007/s10856-005-0627-8. PMID 15803273. 11. ^ Vom Saal, FS; Hughes, C (2005). "An Extensive New Literature Concerning Low-Dose Effects of Bisphenol A Shows the Need for a New Risk Assessment". Environmental health perspectives 113 (8): 926–33. doi:10.1289/ehp.7713. PMC 1280330. PMID 16079060. //www.ncbi.nlm.nih.gov/pmc/articles/PMC1280330/. 12. ^ a b Mitchell, RJ; Koike, M; Okabe, T (2007). "Posterior amalgam restorations--usage, regulation, and longevity". Dental clinics of North America 51 (3): 573–89, v. doi:10.1016/j.cden.2007.04.004. PMID 17586144. 14. ^ a b MCMANUS, KEVIN R.; F, P (2003). "Purchasing, installing and operating dental amalgam separators: Practical issues". The Journal of the American Dental Association 134 (8): 1054–65. PMID 12956345. http://jada.ada.org/cgi/pmidlookup?view=long&pmid=12956345. 15. ^ "What Patients Don’t Know: Dentists' Sweet Tooth for Mercury". Mercury Policy Project. 14 February 2006. http://mpp.cclearn.org/wp-content/uploads/2008/08/whatpatientsdontknow1.pdf. Retrieved 29 July 2009. 16. ^ Bradbard, Laura (December 1993). "Dental Amalgam: Filling a Need or Foiling Health?". FDA Consumer 27: 22. http://findarticles.com/p/articles/mi_m1370/is_n10_v27/ai_14891423/. Retrieved 29 July 2009. 17. ^ Fleming, Michael D. (16 February 2007). "Silver-mercury amalgam disclosure and informed consent". Dental Economics 97 (2). http://www.dentaleconomics.com/articles/article_display.html?id=284909. Retrieved 29 July 2009. 21. ^ World Health Organization, Air Quality Guidelines, 2nd Edition, Chapter 6.9, pgs 3-4; http://www.euro.who.int/__data/assets/pdf_file/0004/123079/AQG2ndEd_6_9Mercury.PDF retrieved: 31/10/2011. 22. ^ Based on 1.7µg over 50 µg/m3 (low average) and 17µg over 25 µg/m3 (high average). Threshold limit values; in accordance with the O.S.H.A. Guidelines for Mercury  and international normals. 25. ^ Berglund, A (1990). "Estimation by a 24-hour study of the daily dose of intra-oral mercury vapor inhaled after release from dental amalgam". Journal of dental research 69 (10): 1646–51. doi:10.1177/00220345900690100401. PMID 2212208. 27. ^ Nylander, M; Friberg, L; Lind, B (1987). "Mercury concentrations in the human brain and kidneys in relation to exposure from dental amalgam fillings". Swedish dental journal 11 (5): 179–87. PMID 3481133. 28. ^ Zander, D; Ewers, U; Freier, I; Westerweller, S; Jermann, E; Brockhaus, A (1990). "Exposure to mercury in the population. II. Mercury release from amalgam fillings [Exposure to mercury in the population. II. Mercury release from amalgam fillings]" (in German). Zentralblatt fur Hygiene und Umweltmedizin = International journal of hygiene and environmental medicine 190 (4): 325–34. PMID 2080964. 30. ^ Hahn, LJ; Kloiber, R; Leininger, RW; Vimy, MJ; Lorscheider, FL (1990). "Whole-body imaging of the distribution of mercury released from dental fillings into monkey tissues". The FASEB journal: official publication of the Federation of American Societies for Experimental Biology 4 (14): 3256–60. PMID 2227216. 31. ^ Takahashi, Y; Tsuruta, S; Arimoto, M; Tanaka, H; Yoshida, M (2003). "Placental transfer of mercury in pregnant rats which received dental amalgam restorations". Toxicology 185 (1–2): 23–33. doi:10.1016/S0300-483X(02)00588-7. PMID 12505442. 32. ^ Brune, D; Gjerdet, N; Paulsen, G (1983). "Gastrointestinal and in vitro release of copper, cadmium, indium, mercury and zinc from conventional and copper-rich amalgams". Scandinavian journal of dental research 91 (1): 66–71. PMID 6573763. 33. ^ Jones, Derek W. (Jan. 1999). "Exposure or Absorption and the Crucial Question of Limits for Mercury". Journal of the Canadian Dental Association 65 (1): 42–46. PMID 9973766. http://www.cda-adc.ca/jcda/vol-65/issue-1/42.html. Retrieved 2010-06-01. "Given the epidemiological evidence we have, it seems likely that humans may have evolved with a threshold level for mercury below which there is no response or observable adverse health effects." 36. ^ Ziff, M.F. (1992). "Documented Clinical Side-Effects to Dental Amalgam". Advances in Dental Research 6 (1): 131–4. doi:10.1177/08959374920060010601. PMID 1292453. http://adr.sagepub.com/cgi/pmidlookup?view=long&pmid=1292453. 37. ^ "Safety of dental amalgam. Fédération Dentaire Internationale Technical Report 33". International dental journal 39 (3): 217. 1989. PMID 2793221. 39. ^ Mandel, ID (1991). "Amalgam hazards. An assessment of research". The Journal of the American Dental Association 122 (8): 62–5. PMID 1918687. http://jada.ada.org/cgi/content/abstract/122/8/62. 42. ^ Diana Echeverria, et al. (1998) The FASEB Journal vol. 12, no. 11, pg. 971-980. Neurobehavioral Effects from Exposure to Dental Amalgam (Hg0): new distinctions between recent exposure and Hg body burden. http://www.fasebj.org/content/12/11/971.full retrieved:19/10/2011. 43. ^ a b c d e Bellinger, DC; Trachtenberg, F; Barregard, L; Tavares, M; Cernichiari, E; Daniel, D; McKinlay, S (2006). "Neuropsychological and renal effects of dental amalgam in children: a randomized clinical trial". JAMA: the Journal of the American Medical Association 295 (15): 1775–83. doi:10.1001/jama.295.15.1775. PMID 16622139. 45. ^ Bellinger, DC; Trachtenberg, F; Barregard, L; Tavares, M; Cernichiari, E; Daniel, D; McKinlay, S (2006). "Neuropsychological and renal effects of dental amalgam in children: a randomized clinical trial". JAMA: the Journal of the American Medical Association 295 (15): 1775–83. doi:10.1001/jama.295.15.1775. PMID 16622139. 47. ^ "Basic Information on Mercury". EPA. 2006. http://www.epa.gov/mercury/about.htm. Retrieved 23 December 2006. 48. ^ a b Melchart D, Vogt S, Köhler W, et al. (April 2008). "Treatment of health complaints attributed to amalgam". J. Dent. Res. 87 (4): 349–53. doi:10.1177/154405910808700410. PMID 18362317. 49. ^ Weidenhammer W, Bornschein S, Zilker T, Eyer F, Melchart D, Hausteiner C (2010). "Predictors of treatment outcomes after removal of amalgam fillings: associations between subjective symptoms, psychometric variables and mercury levels". Community Dent Oral Epidemiol 38 (2): 180–9. doi:10.1111/j.1600-0528.2009.00523.x. PMID 20074291. 51. ^ a b David Wahlberg, "Health Living: Fill It Up But With What", Atlanta Journal and Constitution, April 9, 2002, at 1F. 52. ^ Amy Pyle, "A Debate on Mercury in Fillings", L.A. Times, October 25, 1999, at A. 53. ^ Maura Lerner & Karen Youso, "Health Claims in Dispute Over Replacement Filings", Star Tribune (Minneapolis), October 8, 1995, at 1A. 58. ^ Stein, PS; Sullivan, J; Haubenreich, JE; Osborne, PB (2005). "Composite resin in medicine and dentistry". Journal of long-term effects of medical implants 15 (6): 641–54. PMID 16393132. http://www.begellhouse.com/journals/1bef42082d7a0fdf,56437700108bb47c,3d993af44d47a799.html. 59. ^ Mortensen, ME (1991). "Mysticism and science: the amalgam wars". Journal of toxicology. Clinical toxicology 29 (2): vii–xii. doi:10.3109/15563659109038607. PMID 2051503. 60. ^ Eley, BM; Cox, SW (1993). "The release, absorption and possible health effects of mercury from dental amalgam: a review of recent findings". British dental journal 175 (10): 355–62. doi:10.1038/sj.bdj.4808325. PMID 8257645. 61. ^ Dunsche, A; Kästel, I; Terheyden, H; Springer, IN; Christophers, E; Brasch, J (2003). "Oral lichenoid reactions associated with amalgam: improvement after amalgam removal". The British journal of dermatology 148 (1): 70–6. doi:10.1046/j.1365-2133.2003.04936.x. PMID 12534597. 62. ^ Prochazkova, J; Sterzl, I; Kucerova, H; Bartova, J; Stejskal, VD (2004). "The beneficial effect of amalgam replacement on health in patients with autoimmunity". Neuro endocrinology letters 25 (3): 211–8. PMID 15349088. http://www.nel.edu/pdf_/25_3/NEL250304A07_Prochazkova_.pdf. 64. ^ BE Moen, BE Hollund, and T Riise, Neurological symptoms among dental assistants: a cross-sectional study, J Occup Med Toxicol. 2008; 3: 10. Published online 2008 May 18. doi:10.1186/1745-6673-3-10. 66. ^ Ngim, CH; Foo, SC; Boey, KW; Jeyaratnam, J (1992). "Chronic neurobehavioural effects of elemental mercury in dentists". British journal of industrial medicine 49 (11): 782–90. PMC 1039326. PMID 1463679. //www.ncbi.nlm.nih.gov/pmc/articles/PMC1039326/. 68. ^ Ritchie, KA; Gilmour, WH; MacDonald, EB; Burke, FJ; McGowan, DA; Dale, IM; Hammersley, R; Hamilton, RM et al. (2002). "Health and neuropsychological functioning of dentists exposed to mercury". Occupational and Environmental Medicine 59 (5): 287–93. doi:10.1136/oem.59.5.287. PMC 1740287. PMID 11983843. //www.ncbi.nlm.nih.gov/pmc/articles/PMC1740287/. 76. ^ Brinton L (February 1994). "The amalgam controversy". British Dental Journal 176 (3): 90. doi:10.1038/sj.bdj.4808378. PMID 7599005. 77. ^ Rahill, Paul (2008). "Mercury Rising? Analyzing Emissions and the Cremation Process". Cremationist. CANA. p. 2. http://www.matthewscremation.com/LinkClick.aspx?fileticket=_ASrJIt_lrk%3D&tabid=180. Retrieved 5 October 2011. 78. ^ "Information on Compact Fluorescent Light Bulbs (CFLs) and Mercury". U.S. Department of Energy. November 2010. http://www.energystar.gov/ia/partners/promotions/change_light/downloads/Fact_Sheet_Mercury.pdf. Retrieved 5 October 2011. 79. ^ Schmalz G (December 1997). "Concepts in biocompatibility testing of dental restorative materials". Clinical Oral Investigations 1 (4): 154–62. doi:10.1007/s007840050027. PMID 9555211. 80. ^ Opdam NJ (October 2005). "The future of dental amalgam [The future of dental amalgam]" (in Dutch). Nederlands Tijdschrift Voor Tandheelkunde 112 (10): 373–5. PMID 16300323. 81. ^ Lynch CD, McConnell RJ, Wilson NH (February 2006). "Teaching of posterior composite resin restorations in undergraduate dental schools in Ireland and the United Kingdom". European Journal of Dental Education 10 (1): 38–43. doi:10.1111/j.1600-0579.2006.00394.x. PMID 16436083. 83. ^ Stock, Alfred (1926). "Die Gefaehrlichkeit des Quecksilberdampfes [The Hazards of Mercury Vapor]". Zeitschrift für angewandte Chemie 39 (15): 461–466. doi:10.1002/ange.19260391502. http://www.stanford.edu/~bcalhoun/AStock.htm. 84. ^ Huggins, Hal A.; Anderson (1993). It's All in Your Head: The Link Between Mercury Amalgams and Illness (Paperback). Avery Publishing. ISBN 0-89529-550-4. 85. ^ CBS's 60 Minutes, December 16, 1990. 87. ^ Ring ME (2005). "Founders of a profession: the original subscribers to the first dental journal in the world". The Journal of the American College of Dentists 72 (2): 20–5. PMID 16350927. 91. ^ "Bans mercury in products" (in Norwegian) (Press release). Norwegian Ministry of the Environment. 21 December 2007. http://www.regjeringen.no/en/dep/md/press-centre/Press-releases/2007/Bans-mercury-in-products.html?id=495138. Retrieved 29 July 2009. 92. ^ "Forbyr kvikksølv" (in Norwegian) (Press release). Norwegian Labour Inspection Authority. 2 January 2008. http://www.arbeidstilsynet.no/c26964/nyheter/vis.html?tid=46323. Retrieved 29 July 2009. 101.^ Request to reconvene joint meeting of the: Dental Products Panel & the Peripheral and Central Nervous System Drugs Advisory Committee. 102.^ "ADA Welcomes Additional Scientific Review of Dental Filling Safety" (Press release). American Dental Association. 7 September 2006. http://www.ada.org/public/media/releases/0609_release01.asp. Retrieved 29 July 2009. American Dental Association Link - links to news, journal articles and other resources. The "Mercury Toxicity" Scam: How Anti-Amalgamists Swindle People". Hoping to have responded partly to the SCENIHR questions, I send you my best wishes. I would only like to add, that, regarding my case, I open for research (further analysis, etc.) of any EC health committe that wishes to conduct, in case the EC researchers think that the Spain’s health authorities (and the their public doctors, including dentists/denatl surgeons, neorologists, clinical toxicologists, etc.) are wrong. Subject: Re: URGENT - Fwd: Problems receiving yesterday's "Dental Amalgam - Call for Information"
I am MOST GRATEFUL that you have personally confirmed the reception of my submission! Sorry I didn't respond you before, but due to my dental Hg poisoning I'm now highly hypersensitive to chemicals (Multiple Chemical Sensitivity), have got Mitochondrial myopathy-Chronic Fatigue Syndrome, also Hypersensitivity to Electric Magnetic Fields, etc., reasons why I can't be long in the computer. Thus, I was writing the following to you from time to time since the 12 until now (I also have dysgraphia due to the poisoning, so I had to check the spelling). Thank you for your comprehension! My apologies also because in the text of my email of 10.10.12 to Sanco-SCENIHR-Secretariat@ec.europa.eu (attached "Dental A Call4Info 2012"), particularly towards the end of it, I was too tired to write, so I made many mistakes. When I wrote: "I would only like to add, that, regarding my case, I open for research (further analysis, etc.) of any EC health committee that wishes to conduct, in case the EC researchers think that the Spain’s health authorities (and the their public doctors, including dentists/denatl surgeons, neorologists, clinical toxicologists, etc.) are wrong", actually I tried to say that I would not mind, on the contrary, if SCENIHR or any other health EC committee wish to confirm by themselves (I'm open for any further research/Hg analysis, etc.) 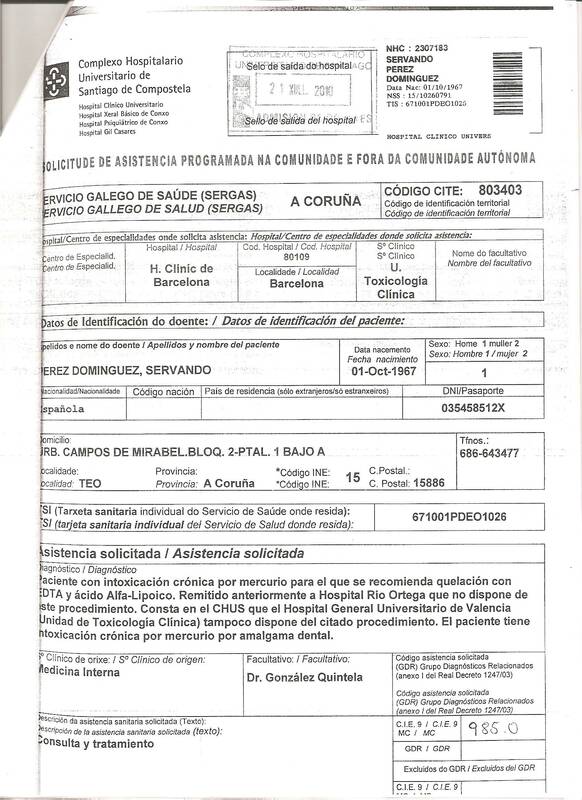 the Spain's health authorities diagnosis of Chronic mercury poisoning due to my 4 dental amalgam fillings. Moreover, in the NGO I represent (www.mercuriados.org), with over 500 cases of Hg poisoning, nearly 99% of the cases are due to dental amalgams (among these cases in our association, there are also public doctors and dentists). And we do not accept just people who 'think' they are Hg poisoned. Analysis and medical reports have to be presented to us first to accept them in our NGO as Hg patients (in MERCURIADOS we have different scientists who collaborate with us: dentists and dental surgeons, chemists, pharmacists, doctors --including clinical toxicologists--, biologists, etc.). If you want to check by yourselves these other dental Hg poisoned cases too, just let us know, so you could perform the tests/analyses you wish. In the World Alliance for Mercury-Free Dentistry (WAMFD), an international coalition of NGOs related to dental mercury problems from the 5 continents, we have much more cases you could investigate if you wish. The WAMFD president, Charles Brown, sent information re the dental amalgam call for information 2012, as well. 1. 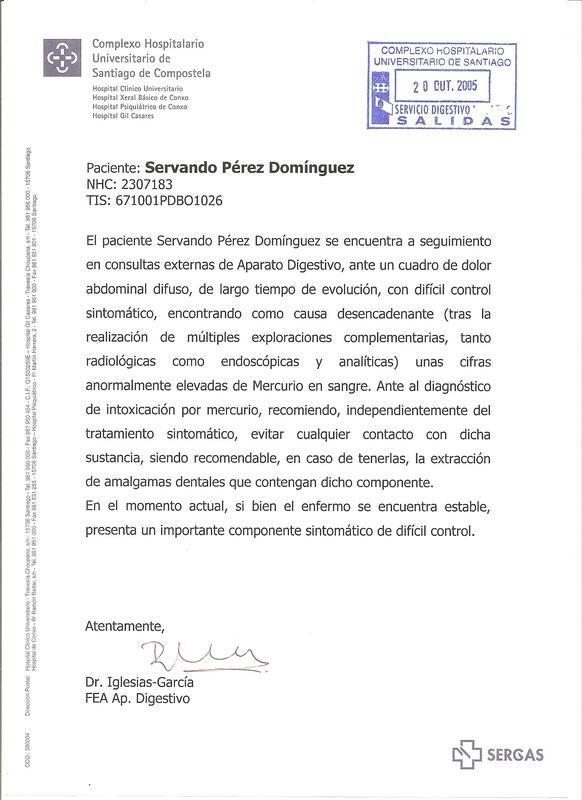 In the doc "Gastroent-Dr.JulioIglesiasGarcia(20.10.05)" this doctor says that for my diagnosis of mercury poisoning he recommends, independently of the symptomatic treatment, to avoid the contact with mercury, being recommendable, in case of having them, the extraction of my dental amalgams. 2. In the doc "Informe.Dr.DominguezMuñoz.Quelac(12.12.06)" this doctor says that the diagnosis of mercury poisoning due to dental amalgams, derives from the analysis of mercury and from discarding mercury from other sources such as fish consumption, shellfish or water contaminated by this metal. It also says that although it has been a slight decline in mercury levels in blood and urine after removal of amalgams, these levels are still clearly in toxic ranges and patient's medical condition is progressive, with progressive deterioration of medical condition that impedes me from living a normal life. And, in this situation, it is essential, at soon as possible, to do a detox treatment in a specialised unit for this purpose. There are also noted my various gastrointestinal symptoms, neurological, musculoskeletal ... derived from my mercurial poisoning due to my dental amalgams. 3. In the doc "Maxilo.Informe(18.12.07)" this dental surgeon doctor says that my chronic mercury poisoning is secondary to dental amalgams, and speaks about many illnesses and symptoms derived from this poisoning. This doctor also recommends urgent detox (chelation) treatment for the Hg accumulated in my body due to the fact to have had 4 dental amalgams from 1988 until December 2005. 4. In the doc "INSS Ratifica IPT x Hidrargirismo d Amalgamas_Servando(7.11.08)" this public institution (National Institute for Social Security) says that my chronic Hg poisoning due to dental amalgams started in 1998 and that this diagnosis was based in the results of the DMPS Challenge Test of 1st July 2008 [76 mcg/gr creatinine of Hg in urine, being 3 mcg/gr creatinine the maximum admitted level]. 5. 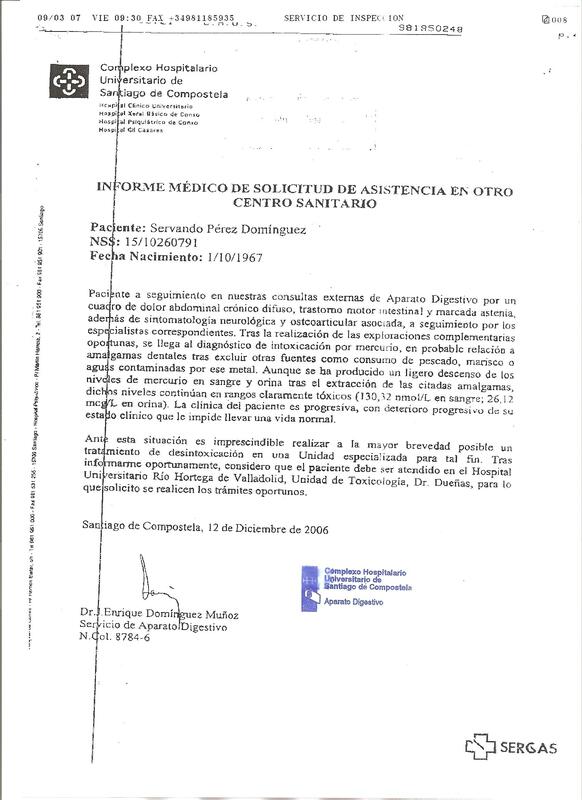 In the doc "Informe.Dr.Climent.Internista+Toxicologo(27.10.09)" this internal medicine doctor and clinical toxicologist says that the Hg chelation for my chronic Hydrargirism secondary to dental amalgams can't be done in his hospital (Hospital General Universitario de Valencia, Service of Internal Medicine, Unit of Clinical Toxicology and Hospital Desintoxication, of which he is the Coordinator), nor in any other public hospitals or other public health centres in Spain, so he recommends me to look for help [chelation] in private health centres in Spain or abroad. Later (4.10.10) this same doctor ("InformeServando-Dr.Climent(4.10.10)") reports that with respect to petition of treatment [chelation] for my chronic hydrargirism due to dental amalgams sent from the Hospital General Universitario of Santiago de Compostela [CHUS], he reports that in his Clinical Toxicology Unit it can not be done, and this was said by him already in 2009 [27.10.09]. Also he notes that the Spanish public health system does not have specific health units that are capable of assessing this type of clinical cases framed in environmental medicine. Finally, he adds that the medicine from the official point of view [allopathic medicine] can provide little help to these patients [people with mercury poisoning from dental amalgams], but it is likely that from the point of view of alternative therapies it is possible to improve the health of these people poisoned by dental mercury. 6. In the doc "InformeSERGAS IntoxAmalgamas(21.7.10)" the epigraph of the report of the Complejo Hospitalario Universitario de Santiago de Compostela [CHUS], about "Requested medical assistance", section "Diagnosis", regarding my case, it says literally: "Patient with chronic mercury poisoning for whom it is recommended chelation with EDTA and alpha-lipoic Acid. Previously submitted to Hospital Rio Hortega [Valladolid], which does not have this procedure. In the CHUS we know that in the Hospital General Universitario de Valencia (Clinical Toxicology Unit) this procedure is not offered either. This patient has chronic mercury poisoning by dental amalgam". 7. In the doc "DEF.PUEBLO.ApoyaTtoAfectadosHgAmalgamas DICIEMBRE 2011" the Spain's Ombudsmam said (letter-resolution of 15.12.11) that there are difficulties in the Spain National Health System for the treatment [chelation] of those injured by dental amalgam fillings, despite these people have the right to receive the Hg chelation. Chelation for dental Hg poisoned people is not offered in the hospitals/health centre of the Spain's public health system. The Ombudsman continues saying that although this treatment is not offered in public health hospitals/centres, these Hg patients have the right to receive appropriate treatment wherever this is available [thus in private health hospitals/centres, as I will be doing between the 16th of October and the 30th of November 2012, in a first phase]. · First, in many cases the patient does not pay for dental care. Public health clinics, Medicaid providers and other healthcare providers (Children’s Health Insurance Program (CHIP), Indian Health Service, Military Dental Services, the Office of Dentistry in the U.S. Department of Veterans Affairs, etc.) offering services for which the cost of care is borne by the taxpayer rather than the patient would clearly not experience a decline in patient numbers if amalgam were no longer available. · Second, a composite filling is, on average, more expensive than amalgam (for fillings in rear teeth) only if one goes by the commercial fee charged by the dentist. However, when one considers as well the additional costs to the environment and human health of using mercury in dental fillings —“external” costs that are ultimately borne by society— the real cost of amalgam becomes more clear". (p. 5 of http://iaomt.guiadmin.com/wp-content/uploads/Real_cost_of_Dental_Mercury_April_2012-FINAL1.pdf). One occasionally hears that the filling materials used in place of amalgam may have their own risks. In general, EU health authorities and dental associations have concluded that the use of non-metallic restoration materials is safe for patients (including pregnant woman and children), as well as for dental health professionals. Some resin-based filling materials contain bisphenol A (BPA), a known endocrine disruptor. Researchers have concluded that BPA exposure from composite resins is considerably lower than tolerable daily intake values specified by Health Canada, the USEPA and the EU Scientific Committee for Food, and do not present a significant risk for adverse health effects (Richardson et al. 1999; SCENIHR 2008; Van Landuyt et al. 2011). Moreover, composite resins without BPA are widely available and, according to the American Dental Association, BPA is an increasingly rare ingredient in alternative filling materials (ADA 2010). One key advantage of mercury-free restoration techniques is that they leave more intact natural tooth tissue as compared with dental amalgam restoration. While the use of dental amalgam tends to weaken the tooth structure (due to the removal of substantial healthy tooth tissue), alternative materials tend to prolong the life of the tooth beyond what may be expected from amalgam. WHO recently confirmed that preserving the tooth structure and improving the survival of the tooth is imperative (WHO 2010). Due to the concerns sometimes expressed that there may yet be minimal unknown risks associated with the use of mercury-free filling materials, for the purpose of this analysis it is assumed that any such risks are more than offset by the significant benefits of retaining more of the natural tooth structure. (…) it is clear that the real cost of using amalgam far outweighs the cost of using mercury-free composite, not to mention an even cheaper alternative such as ART". (p. 46 of http://iaomt.guiadmin.com/wp-content/uploads/Real_cost_of_Dental_Mercury_April_2012-FINAL1.pdf). I was a very healthy person (competition sportsman), with a promising university career at the University of Santiago de Compostela (USC) and other universities, both as national and international researcher (Eurokid project, www.barcelonacontraelracisme.cat/web/fitxam.php?id=171&idi=ANG, www.doredin.mec.es/documentos/009200330037.pdf, www.diversidadjuvenil.org/si-credits.html, Rebels project, www.respect-network.org/LinkClick.aspx?fileticket=hYN7YyGJFPA%3D&tabid=146&mid=806, www.uapa.edu.do/docs/revista/Enero-Diciembre2008.pdf, etc. ), having had received a number of research grants --including at the Harvard Graduate School of Education in 1997--, having been the second in my class at the college of Sciences of Education of the USC, having gotten an important research national award in Spain, etc. The dental Hg poisoning destroyed my professional, my aims as a sportsman, social and cultural aims and other personal aims (my teaching and research work ended at the USC on 30.9.09 due to all my problems derived from the poisoning, including a terribly bad memory that led me to even forget the dates for my students to have their exams in college, etc., including my aims as a Medicine student), all of which is now in stand by, hoping that the Hg chelation that I'll start, privately, on the 16th of this month in a private health centre in Madrid (www.fundacion-alborada.org/images/documentos/Areamedica/quelacion3.pdf) will eventually allow me to work and study again, perhaps in a few years time. I can't even hold my 2 years old child since months ago for more than a few minutes (and I was a rowing competition sportsman, never tired), and my wife has to take care not only of our child but also of myself. Despite it all, I am indeed not among the worse cases of bad health due to dental Hg, not among the worse cases of huge tragedy due to the dental Hg (at least I could have a child and got a university retirement pension from the Spain's Social Security System due to the Hg poisoning problems). Some people, are in a much worse position than me, unable to work but with no money to survive with dignity, and even with no official recognition of Hg poisoning ad the illnesses derived from it, being simply (wrongly) classified as persons whose problems are 'just in their heads'. This disastrous situations led to some of them to live almost in the indigence and even to commit suicide.. Bearing all this in mind, I have the hope that on this occasion the EC health and environment committees will evaluate the dental amalgam issue with professionalism and fairness, not as it happened with the SCHER and SCENIHR 2008 reports, because in the meeting of January 20th 2009 (http://amalgam.homepage.t-online.de/dokument/090121short_report_dg_sanco_meeting_200109_2.pdf), these committees told us (the NGOs and other organizations present in the meeting) that they didn't have time, nor the human and economic resources, to analyse the literature against the quality and/or safety of dental amalgams (but they analysed the literature in favour of them)..., so this is all but scientific. Environmental, economic and health problems due to dental amalgams (not only chronic mercury poisoning, also oral electrogalvanism and allergy or hypersensitivity to mercury and/or other components of amalgams) are 100% preventable if we abandon the idea of continuing sealing cavities with mercury. If you need any further information/clarifications, pls contact me at any time. I think that I'll be able to check emails until 12:00 pm on the 15th of this month, and then all the time after the 17th in the evening. (President of MERCURIADOS and First Vicepresident of the World Alliance for Mercury-Free Dentistry). Didn't you receive my confirmation sent today? Please see below? Yes, we have received the documents. We do not have an automated system which acknowledges the receipt. Please don't worry. I will forward your emails to Dr Vladimir Garkov who is responsible for the SCENIHR. (+32 229-66559). Subject: URGENT - Fwd: Problems receiving yesterday's "Dental Amalgam - Call for Information"
I wonder if you could help me. On the 10th of this month I sent an email (see text attached), with many docs enclosed, to Sanco-SCENIHR-Secretariat@ec.europa.eu regarding a 2012 Call for Information on Dental Amalgam. However (pls see below) the email was not received by Sanco-SCENIHR-Secretariat@ec.europa.eu, thus I sent this and other 3 emails with the docs sent altogether on the 10th divided into 3 (which I'll forward to you in a minute). I asked therefore, yesterday, to Sanco-SCENIHR-Secretariat@ec.europa.eu, if they could confirm me that they had received the email and the docs, but I have not received answer as yet. On Tuesday 16th I'll be starting Hg chelation in Madrid (www.fundacion-alborada.org/images/documentos/Areamedica/quelacion3.pdf), and won't probably have access to internet for some time. I'm WORRIED if I don't receive before Tuesday 16th confirmation from Sanco-SCENIHR-Secretariat@ec.europa.eu that they finally received everything I sent them initially on the 10th. Could you help me in some way? [Fundador y presidente de la "Asociación Española de Afectados por *Mercuri*o de *A*malgamas *D*entales y *O*tras *S*ituaciones" - *MERCURIADOS*. Subject: Problems receiving yesterday's "Dental Amalgam - Call for Information"
Yesterday (10th October 2012) I sent you a long email message (that later I sent you attached, because you received it cutted-incomplete). That email mesage had many attached docs. I am contacting you now because, as you can see below, I've just received an email message saying that my yesterday email (with a number of attached docs) was not received at Sanco-SCENIHR-Secretariat@ec.europa.eu due to "Unspecified Error (SENT_MESSAGE): Connection reset by peer". For this reason, I'm attaching in a few minutes time the docs I sent yesterday, but divided in various emails with the subject <<Problems receiving yesterday's "Dental Amalgam - Call for Information">>, plus (1), (2), (3) or the necessary. I also attach again here, just in case you did not received it either, the text of the yesterday's email message. I would appreciate if you could confirm when you receive all this.